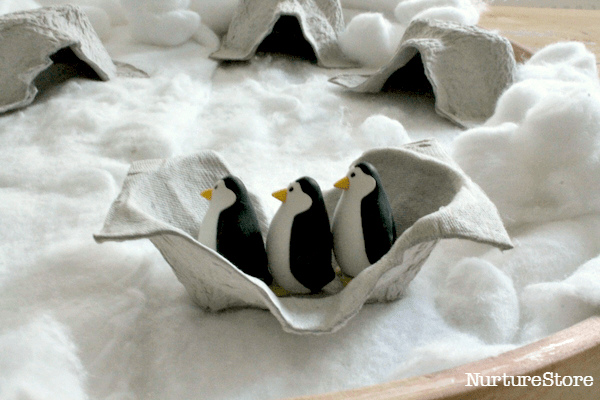 Fans of Pingu, make your own penguin small world for lots of pretend play and story telling. 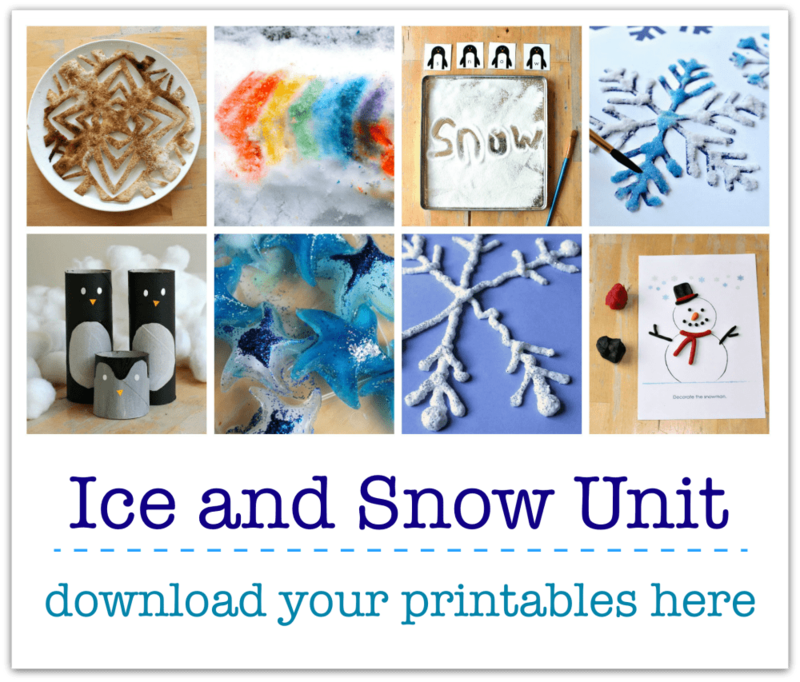 Great for winter sensory play too. My daughter thinks Pingu is hilarious. 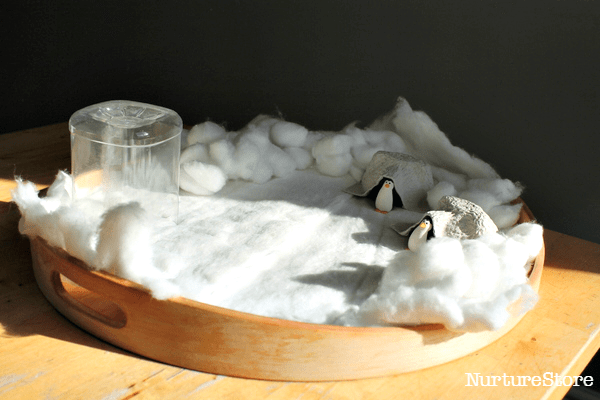 She also loves story-telling and so a penguin small world is a perfect combination of her favorite things, for lots of imaginary play and winter sensory fun. We put this penguin small world together in minutes, using a few bits and pieces from around the house. Play set-ups don’t need to be extravagant. Simple is great – as it lets children add in their imagination. :: a wooden tray, which was just the right size for playing, and made it really easy to carry from playroom to bedroom and back again. It’s great to have a small world set up for days, so children can keep coming back and developing their stories, but really handy to have something fairly small and easy to store. :: a few penguins – ours are actually erasers (from Paperchase). You can also find some printable penguins puppets over at let’s Play Music. 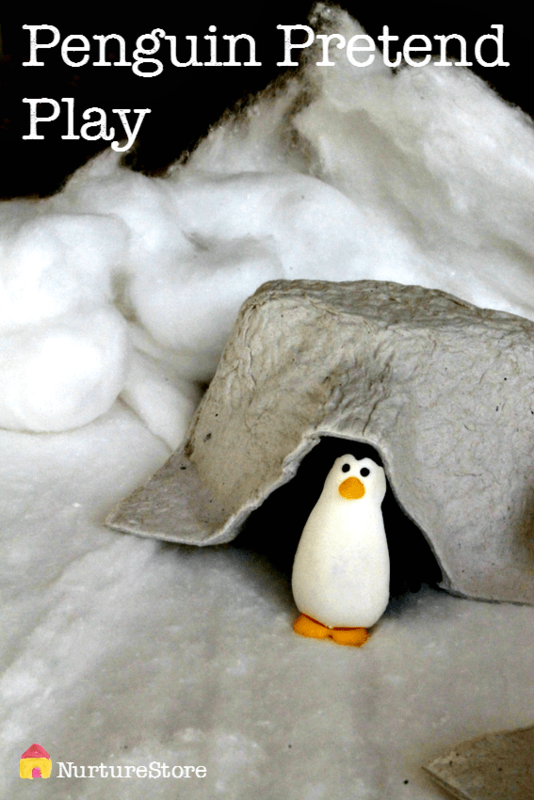 :: cotton wool – a big roll to carpet the ground and also some cotton wool balls, because you know Pingu likes a snowball fight! That’s it – easy peasy! A super-snowy, full-of-imagination, winter play scene. My son LOVES to play with his little penguins (and other animals) He’s really into building the landscapes. We talk about the animals’ habitats and try to come up with ways to create them. I used to make scenes myself and present them to him, but now he’s enjoying making them himself! When my kids were little they were definite pingu fans! This is completely adorable.